My dear Sir,—I can only suppose that another false report of my having finished ‘Edwin Drood’ has been let afloat in America, I was asked to finish the story soon after Dickens’s death, and positively refused. Any assertion or newspaper report which associates me in any way with any attempted completion of the story is absolutely false. I shall be obliged if you will at once communicate this reply of mine to Mr. Barnes, with my authority to publicly contradict the rumour which has deceived him and which may deceive others. Very truly yours, WILKIE COLLINS. For the session, I’d like you all to read Drood (obviously) and also have a read of Gerhard Joseph’s ‘Who Cares Who Killed Edwin Drood? or, on the Whole, I’d Rather Be in Philadelphia’, Nineteenth-Century Literature 51 (1996), 161-175. Are you a ‘Porfirian’ or an ‘Agathist’ with respect to the novel? 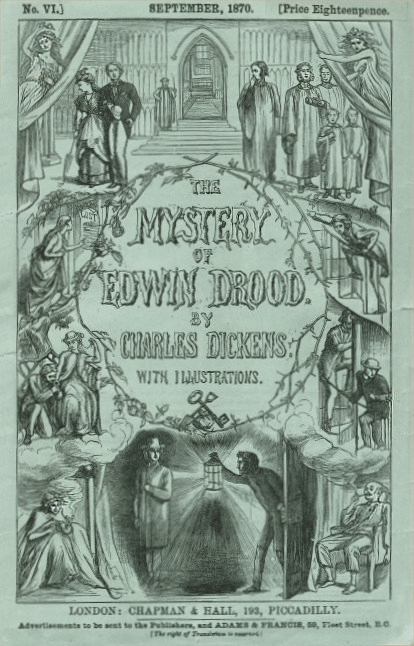 Do you think Drood a psychological or a detective story, a whodunnit or an obviously-hedunnit? 1. The Crimean War. It would help if you familiarised yourself a little with the prosecution of this war (the reason why so many pubs across London are called The Alma and where the Balaclava got its name). Matthew Lalumia’s ‘Realism and Anti-Aristocratic Sentiment in Victorian Depictions of the Crimean War’ [Victorian Studies, Autumn 1983] is a good overview of the ways in which the war worked its way into Victorian visual culture; Dickens is mentioned in passing. Stefanie Markovits, ‘Rushing into Print: “Participatory Journalism” during the Crimean War’ Victorian Studies (2008) is a thorough account of the journalistic and newspaper accounts of the war. Some of Grace Dent’s chapter on Dorrit and the Crimean war, in Dickens and empire: discourses of class, race and colonialism in the works of Charles Dickens (Ashgate, 2006) is available on Googlebooks. 2. The Circumlocution Office. Dickens based his satirical portrait of governmental obfuscation and incompetence on HM Treasury, you know. It used to be thought that the Circumlocution Office reflected Dickens’s agreement with the Northcote-Trevelyan report [that’s a PDF link to the actual 1853 report, there — it makes interesting reading, but it is lengthy] advocating administrative reform of the Permanent Civil Service. But a recent article in the Dickens Studies Annual (DSA 22 (1993) 283–302, not online but in the library) by Trey Philpotts argues against this old belief. He suggests that ‘what galled Dickens in the Treasury Office-his model for the Circumlocution Office-was a class-based elitism that Northcote-Trevelyan tended to perpetuate’ Instead, says Philpotts, ‘Dickens directed his satire at concrete, administrative practices, shrewdly analyzed as to origins and outcome, rather than at some systemic failure too vast to understand or combat.’ It’s also worth noting that Dickens wrote numerous articles for Household Words on the evils of administrative red-tape: you might want to look up “That Other Public,” HW XI (February 3, 1855), 1-4; “Prince Bull. A Fairy Tale,” HW XI (February 17, 1855), 49-51; “The Thousand and One Humbugs,” HW XI (April 21 and 28, May 5, 1855), 265-67, 289-92, 312-16; “The Toady Tree,” HW XI (May 26, 1855), 385-87. 3. Napoleon III. This is more a personal crotchet for me, but important I think — it explains (I’d argue) why France has the large role in this novel it has. There’s a post on this very blog outlining what I consider the parallels between Rigaud and Louis Napoleon. Read it and see what you think. 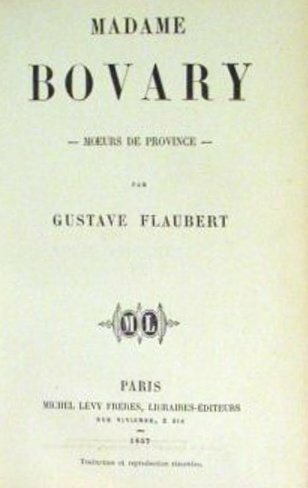 At any rate, some sense of the history of France from 1848 through the 1850s is a useful context for the novel. We’ll talk about each in turn. One more thing: you may have seen this Daily Mail news story, ‘The real Little Dorrit: the inspiration for Dickens’ classic novel was a single mother-turned-prostitute‘ [25th October 2008]. It makes good copy, and there’s some interesting material in there on Urania Cottage, but I don’t think it’s right about the source for Little Dorrit herself. 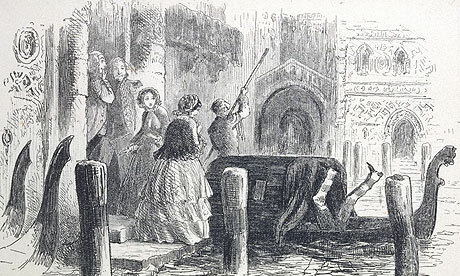 Dickensian scholars have known about Caroline Maynard for a long time; she lived with a well-off man as his common-law wife for nine years, had a kid and used his money to help her younger brother and sister; but then the man buggered off and she resorted to prostitution. Her brother wrote Dickens a begging letter, and Dickens (Michael Slater notes that he was ‘much affected’ by her ‘sisterly devotion’) arranged for them to emigrate and start a new life. Not much, there, in common with Little Dorrit’s own circumstance, really. In his notes for Little Dorrit, Number XVI, “Containing the history of a Self-Tormentor” (Bk. II, ch. 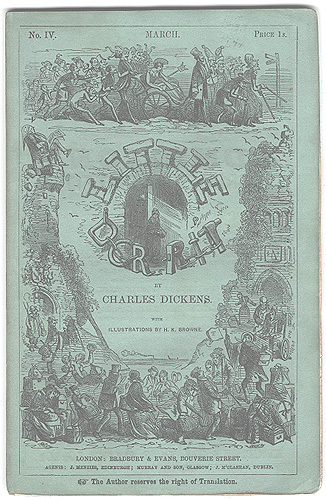 21), Dickens includes the entry: “Miss Wade’s Story. Unconsciously laying bare all her character.”‘ The chapter has a curious and somewhat awkward place in the novel. Dickens was persuaded by Forster to make Miss Wade’s autobiographical revelations a written narrative, and the result can be questioned. Arthur Clennam, for example, is rather unbelievably allowed no reaction to her story here or elsewhere in the novel. Yet the interpolated tale is thematically appropriate. It bears significantly on the master-slave opposition that runs through the novel, revealing that the victim who persists in his victimization may be the source of his own torment. Imprisonment, as the novel abundantly shows, can be unfairly imposed from without; it can also be, as Miss Wade’s story shows, perversely self-imposed. I’d like to discuss the various ways people in this novel are ‘imprisoned’: by poverty, by riches — to cite the titles of the novel’s two parts — by class, by gender, by family, by religion, by nation and by love. But I’d like to do something more, as well, and discuss the extent to which discourse itself –textuality, writing, Dickens’s own business — emprisons, and is demonstrated as emprisoning in this book. 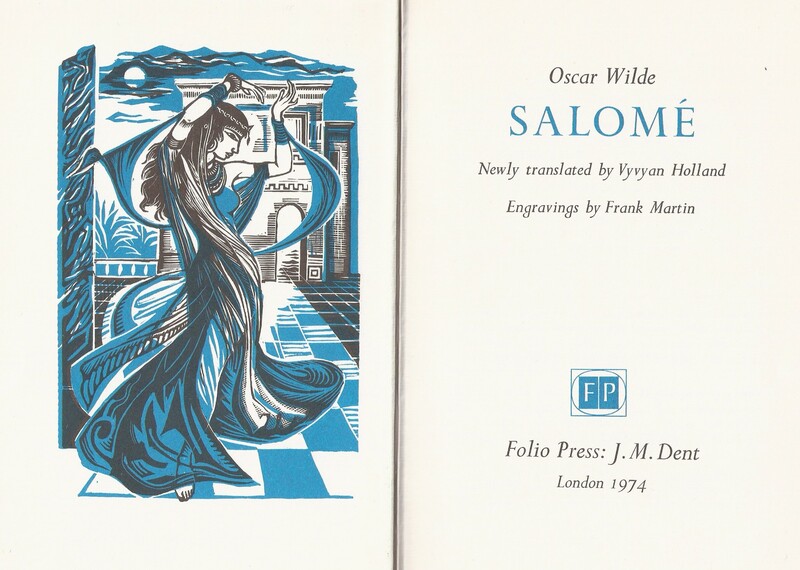 Though the novel has other metaphoric complexes, these remain central, and Little Dorrit as a whole can be profitably read, in Jakobsonian terms, as the metonymic displacement, exten- sion and variation of a limited numiber of significant metaphors or paradigms. The actual Marseilles prison reappears as the actual Marshalsea prison and casts its “prison taint” on any number of houses in the novel: Mrs. Clennam’s, Casby’s, Miss Wade’s, even the Meagles’s, as well as on the Convent of the Great Saint Bernard and on society as a whole. Rigaud’s “intent to be a gentleman” (I, 1) is repeated by William Dorrit, whose raison d’etre, both in prison and out, is to be “always a gentleman” (II, 19), and by many other would-be aristocrats. And the master-servant relationship initiated by Rigaud and Cavalletto is repeated, qualified, “turned” in the re- lationships of Mr. Meagles and Tattycoram, Casby and Pancks, William Dorrit and Nandy, Mrs. Gowan and Mr. Meagles, Merdle and society, the Chief Butler and Merdle, and so on. Criticism has pretty fully explored the ramifications of such metaphoric nuclei, and with its help one can savor the special pleasures of “readerly” interpretation, which lie in the recognition of meanings emerging from melodic variations played upon basic harmonic chords. To complete the deliciously retro 70s/80s vibe here, I’d flag up a couple of relevant links. One is Foucault’s Surveiller et punir: Naissance de la Prison [1975; translated as Discipline and Punish in 1977]; a work we’ve come across before on this programme, of course. More traditional is Philip Collins’ Dickens and Crime [some of which is available on Google Books here, and all of which is in the library here] which deals with crime, criminals and punishment. There are several good studies on the actual Victorian prison experience, not least Philip Priestley’s Victorian Prison Lives: English Prison Biography 1830-1914 (1999). This latter doesn’t seem to be in the library, but I have a copy if anybody wants to borrow it. Tonight’s seminar is on Gustave Doré, and 1872’s London: a Pilgrimage in particular. Quite a lot of Fantasy and faith: the art of Gustave Doré (ed. Eric Zafran, Robert Rosenblum and Lisa Small; Yale University Press, 2007) is available on Google Books. Only a few pages of this study (these) are devoted to the London book, although they are pretty interesting. But the whole volume has illuminating things to say. This 1866 Contemporary Review comparison of Millais and Doré is interesting, too; although obviously it predates the London book. 7. George Eliot, Adam Bede (1859); theories of realism. 8. Elizabeth Gaskell, Mary Barton (1848); historicism and the industrial novel. Text for discussion: ‘Introduction’ to Andrew Miller’s The Burdens of Perfection: On Ethics and Reading in Nineteenth-Century British Literature. Ithaca: Cornell UP, 2008. I look forward to discussing ethics with you! Kate Flint – “`Bottled lightning’: Flash Photography and the Language of Modernity” – as part of the Richard Hoggart Lecture Series. Professor Kate Flint taught at the Universities of Bristol and Oxford before moving to Rutgers University in New Jersey, where she is currently Chair of the English Department. Her lecture, ‘”Bottled lightning”: Flash Photography and the Language of Modernity’ is based on her work for a new book provisionally entitled “Flash! Photography, Writing, and Surprising Illumination.” Flint’s interdisciplinary and transatlantic research spans the nineteenth and twentieth centuries. Previous books include The Victorians and The Visual Imagination (Cambridge University Press, 2000) and The Woman Reader, 1837-1914 (Oxford University Press, 1993). Her areas of specialization include Victorian and early twentieth-century cultural and literary history, visual culture, women’s writing, gender studies, and transatlantic studies. Her most recent book is The Transatlantic Indian 1776-1930 (Princeton University Press, 2008), which looks at the two-way relations between Native Americans and the British in the long 19th century, exploring questions of modernity, nationhood, performance, popular culture, and the impacts of travel.